Over the moon to be able to eat raw eggs again, Associate Art Director Soni Obinger whipped up this tasty (and unconventional) Raspberry Chocolate Mousse. Why NOT this recipe? 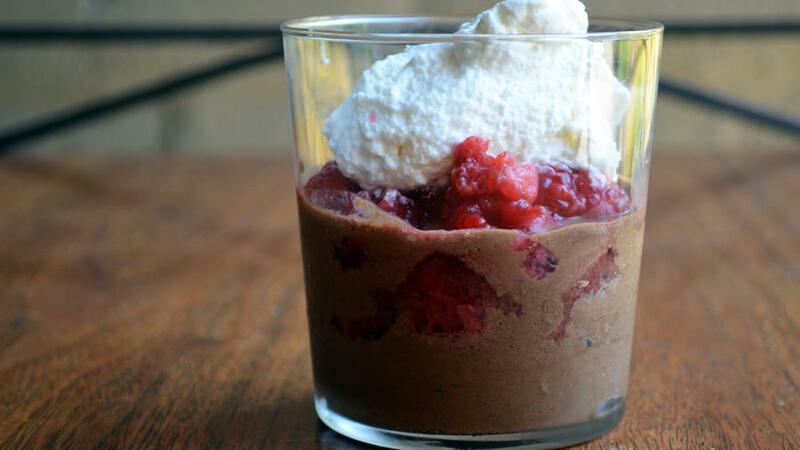 Fresh raspberries, dark chocolate mousse, whipped cream—who could say no!? I have a soft spot for mousse, as classic as it is. My mom used to make it for us on any given evening, just as a treat. She would put it in champagne flutes to make us feel fancy, even if it was just a regular old Sunday evening. This version has fresh summertime raspberries to add a pop of color and tang. PLUS, now that I’m not pregnant or nursing, I can eat raw eggs!! What was it like to grow the ingredients for your recipe? So, I bought these at the store. I don’t have a huge yard, so I couldn’t plant them. I was hoping to buy them at the farmers’ market, but unfortunately, that didn’t happen either. So these raspberries will do, and I’m sure they’ll be pretty tasty, although probably not as tasty as homegrown. It was really fun and easy. The chocolate melted beautifully in my makeshift double boiler, and my handy Kitchen-Aid helped out with whipping the egg whites and the cream. I do wish that the steps in the recipe were a bit more broken up, instead of being written in paragraph form. Luckily, there weren’t that many steps, so I managed not to skip any. After sitting in the fridge for about 45 minutes, the mousse was delicious. It was light and fluffy. And the balance of the tart raspberries, dark chocolate, and sweet whipped cream was perfect. My chocolate-hating husband even enjoyed it (actually, he doesn’t hate chocolate; he just doesn’t get excited about it). The only problem arose when I wanted to bring it in the next day to share with everyone in the Cookbook Club. When I got to work to assemble the cups, the mousse was unfortunately pretty deflated. It still tasted really good, but it definitely did not have that mousse texture that was so wonderful the night that I made it. Will I grow this again? Will I make this dish again? If I had the space, I totally would grow raspberries! I’m not sure if I would use this specific mousse recipe again, since it wasn’t able to hold up overnight, but I would definitely use this recipe as an inspiration. I really liked layering in the raspberries and using super dark chocolate. Put the chocolate and rum in the top of a double boiler over low heat. Stir continuously until the chocolate is smooth and almost melted. Remove from the heat when it’s almost completely melted, and keep stirring to finish melting the last bit. Don’t overheat: This will cause the chocolate to seize and result in an undesirably clumpy mousse. Set aside to cool slightly, about 5 minutes. Thoroughly fold the egg whites into the chocolate mixture, until completely blended. Spoon about 3 tablespoons of the mousse into a ramekin or pretty glass. Layer ¼ cup (40 g) raspberries on top, then spoon on a few more tablespoons of mousse. Top with ¼ cup (40 g) raspberries. Repeat to make three more servings. Cover and refrigerate for at least 30 minutes, up to 3 hours, before serving. Just before serving, top with a healthy dollop of whipped cream and shave a little chocolate over the cream for garnish. Note: This recipe contains raw egg, so be mindful of dietary restrictions. Before you start, make sure the cream, the bowl and the whisk are cold. If you have time, put the bowl and the whisk in the freezer for a few minutes beforehand. In a large bowl, start whisking the cream either by hand using large strokes in different directions, or with an electric mixer on medium speed. When soft peaks begin to form, add the vanilla and powdered sugar. Continue whisking until the peaks return and can stand on their own.